As with every year, I have today off, it being Thanksgiving and me being a US gov employee. I don't celebrate it with turkey, natch, not being American, but I celebrated my day off with as much enthusiasm as I do for every day off. This entailed starting with a lie-in. Then having bread and honey for brekky instead of muesli, then, after a while, going to Mondial Market to buy a nice big box of Yorkshire Tea. It's the only place that's easily accessible (I don't count the centre of town as easily accessible) that sells this delectable brew, so I'm definitely a fan. While I was there, I compared baked bean prices with Carrouf. This is quite an expat thing to do apparently so it's nice to know I'm in such illustrious company! Carrouf tins cost €1.44, MM's €1.34 - bargain! I bought two. Then I mooched around several times noting jars of mincemeat, and Christmas puddings (I have one from last year still) should I find myself without and suffering from a craving for sweet sticky spiciness. I usually wait until I get home to the UK but I'm going there for New Year week this year so will be without mince pies over Christmas unless I make them myself! I would have bought a jar of spare rib sauce but they'd run out - I love that stuff, straight out of a Chinese restaurant (and probably full of MSG and E numbers). I also bought some rice pancakes to make nems with and a nifty gadget of plastic plates full of holes that you lay them on to drain and keep them moist. Works a treat. 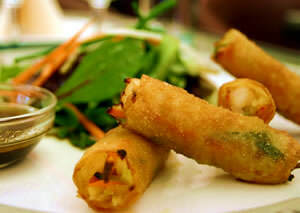 What doesn't work so well is making a bunch of nems from the wrong ingredients, as I found out this evening. I nearly had it right - rice vermicelli (MM), grated carrot, onion slices, nuoc nam sauce (subsequently thrown away for being dodgy) and egg (cooked or raw, it didn't say, so used raw). What I didn't have right was the meat. It says to use ground pork or something, chicken probably. I used lardons. Take it from me, lardons don't work in a nem.The taste is all wrong and you just end up with a Vietnamese bacon and egg buttie. I then had to roll and fry the neatly rolled nems. What a laugh that was! My youngest, who made some nems in Maternelle, volunteered to help. Unfortunately he'd forgotten how and tried to cram in way too much filling. Result - rice pancake rolls in shreds with bits poking out. If I hadn't used raw lardons and egg I would have suggested turning the nems into spring rolls, but I was obliged to go on and on to the end. I don't think I had the cooking right either - a Tefal non-stick wok with 1cm of Isio 4 (Carrouf brand) very hot, but either not hot enough or deep enough or something enough because instead of going a lovely golden brown, they stayed white-ish, imbibed vast quantities of oil and went all flabby when removed from the pan. They sound great, don't they? Bet there'll be a queue outside the door once word gets out! The boys did in fact eat them - they love oily crap - though they voted the nuoc nam sauce into the bin for smelling like old socks and tasting like them too. I'm coming to the conclusion that I'm not a natural nem cook. This is the second time I've tried, and the second time it's been a disaster. I will stick to spring rolls and fresh nuoc nam sauce from now on. I will remember, the next time I'm tempted to have another go. Or I could just look up how it's done properly, like here. On second thoughts, I'm too traumatised! Meanwhile, I'm appalled at having had to throw out the cooked mixture which I threw into the wok to try and improve it. It didn't, not even with the addition of soy sauce and sesame oil. It's the lardons. They are just not right - bacon and egg is good in a sarnie or on a plate, not with rice vermicelli, off nuoc nam sauce and onion. Take it from me!